Starting and running a company is not a marathon or a sprint. It is a decathlon. Sometimes you have to sprint. Sometimes you have to pace yourself. Sometimes you have to throw the javelin. Sometimes it’s heavy lifting like the shot put. If you are health conscious, the Glycemic index is definitely of interest to you. The Glycemic index ranks carbohydrates based on how quickly they convert to glucose in the human body. This is important because carbs that increase blood levels quickly, also increase insulin levels quickly, which carries serious consequences for those with diabetes. Studies show that nuts rank low on the Glycemic index and are good for people trying to monitor their cholesterol, and are the perfect snack because they keep you full for longer. Almonds are especially championed for their ability to lower your cholesterol. The Diabetes Monitor points out that although nuts are mostly fat, they are incredibly helpful in maintaining a healthy lifestyle. Check out this great clip featuring KIND on the Doctors! 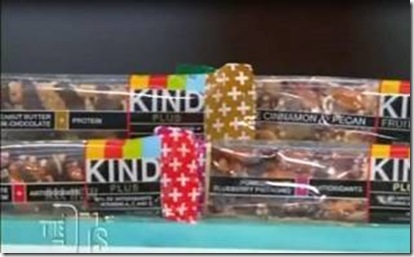 The host highlighted the various health benefits of KIND and encouraged viewers to incorporate healthy snacking into their new year’s health resolutions. Click on this image to view! Two good indicators here are that Palestinians acknowledge the importance of addressing Israeli society, and that more than 80% believe in non-violence as a mean to end the conflict. My brother shared this hilarious video, which while mocking the obsession of people with Apple products, actually highlights the power of brands. Apple does actually have a lot of technological reasons for its success. But its brand indeed transcends much of the functional strengths to the iconic sphere and status symbol. It is incredibly saddening and disappointing to see the intolerance that is terrorizing civilians in the Netherlands today. This article in the Brussels Journal introduces the term “Decoy Jew,” or policemen dressed in traditional Jewish garb who are looking to arrest attackers who accost them, assuming they are Jews. It is horrible that Jews are still encountering this needless hatred and bias and a sad fact that these “Decoy Jews” need exist. An amazing OpEd in Israel’s Ha’aretz newspaper shows that OneVoice’s Imagine 2018 campaign is a bold and innovative one, and is quickly gaining popular attention. Prominent Israeli politicians have been receiving a mock ups of an Israeli newspaper from the future, thanking the politicians for attaining peace by 2018. Read more to see the extensive positive attention that Imagine 2018 has garnered already!